, or Hevelke, a celebrated astronomer and mathematician, was born at Dantzic January 28, 1611. 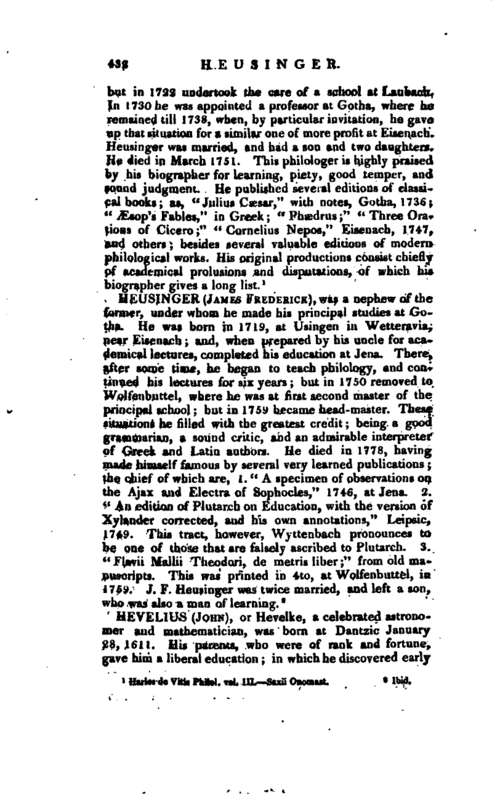 His parents, who were of rank and fortune, gave him a liberal education; in which he discovered early | a propensity to natural philosophy and astronomy. He studied mathematics under Peter Crugerus, in which he made a wonderful progress; and learned also to draw, to engrave, and to work both in wood and iron in such a manner as to be able to frame mechanical instruments. In 1630 he set out upon his travels, on which he spent four years, visiting Holland, England, France, and Germany; and on his return was so taken up with civil affairs, that he was obliged to intermit his studies for some years, until his master, Crugerus, who foresaw his future fame, recalled him to the study of astronomy; and in 1639 Hevelius began to apply himself entirely to it, by building an observatory upon the top of his house, which he furnished with instruments for making the most accurate observations. 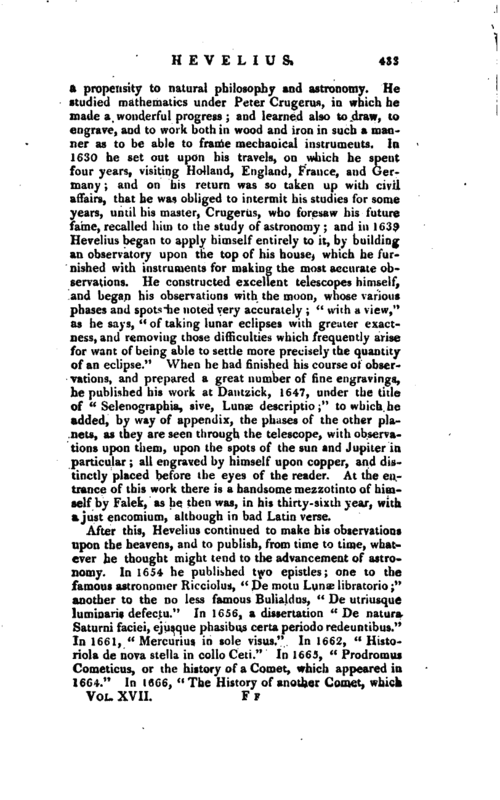 He constructed excellent telescopes himself, and began his observations with the moon, whose various phases and spots he noted very accurately; “with a view,” as he says, “of taking lunar eclipses with greater exactness, and removing those difficulties which frequently arise for want of being able to settle more precisely the quantity of an eclipse.” When he had finished his course of observations, and prepared a great number of fine engravings, he published his work at Dantzick, 1647, under the title of “Selenographia, sive, Luna3 descriptio;” to which he added, by way of appendix, the phases of the other planets, as they are seen through the telescope, with observations upon them, upon the spots of the sun and Jupiter in particular; all engraved by himself upon copper, and distinctly placed before the eyes of the reader. At the entrance of this work there is a handsome mezzotinto of himself by Falek, as he then was, in his thirty-sixth year, with a just encomium, although in bad Latin verse. After this, Hevelius continued to make his observations upon the heavens, and to publish, from time to time, whatever he thought might tend to the advancement of astronomy. In 1654 he published two epistles; one to the famous astronomer Ricciolus, “De motu Lunae libratorio;” another to the no less famous Bulialdus, “De utriusque luminaris defectu.” In 1656, a dissertation “De natura Saturni faciei, ejusque phasibus certa periodoredeuntibus.” In 1661, “Mercurius in sole visus.” In 1662, “Historiola de nova stella in collo Ceti.” In 1665, “Prodromus Cometicus, or the history of a Comet, which appeared in 1664.” Jn 1666, “The History of another Comet, which | appeared in 1665;” and, in 1668, “Cometographia, cometarum naturam, et omnium a mundo condito historian! 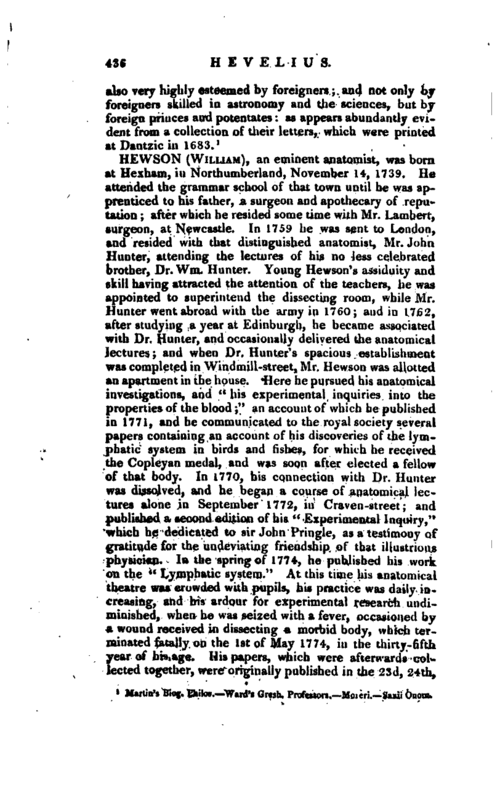 exhibens.” He sent copies of this work to several members of the royal society at London, and among the rest to Hooke; who in return sent Hevelius a description of the dioptric telescope, with an account of the manner of using it; and at the same time recommended it to him as greatly preferable to telescopes with plain sights. 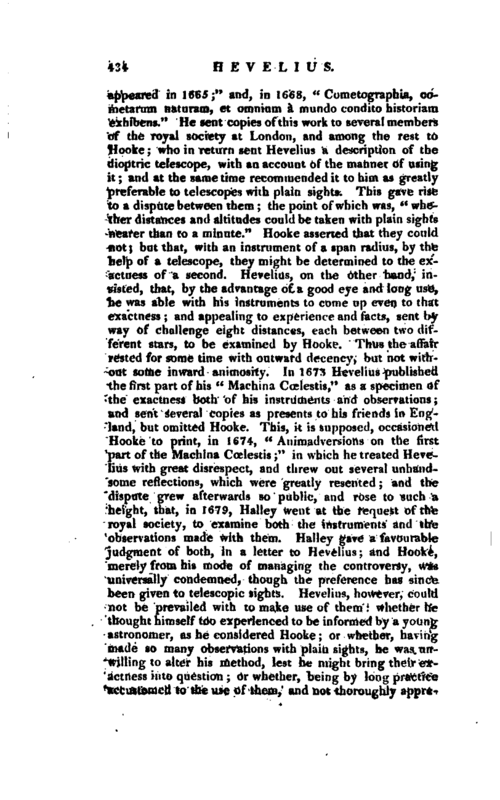 This gave rise to a dispute between them; the point of which was, “whether distances and altitudes could be taken with plain sights nearer than to a minute.” Hooke asserted that they could not; but that, with an instrument of a span radius, by the help of a telescope, they might be determined to the exactness of a second. Hevelius, on the other hand, insisted, that, by the advantage of a good eye and long use, he was able with his instruments to come up even to that exactness; and appealing to experience and facts, sent by Way of challenge eight distances, each between two different stars, to be examined by Hooke. Thus the affair rested for some time with outward decency, but not without some inward animosity. In 1673 Hevelius published the first part of his “Machina Ccelestis,” as a specimen of the exactness both of his instruments and observations; and sent several copies as presents to his friends in England, but omitted Hooke. 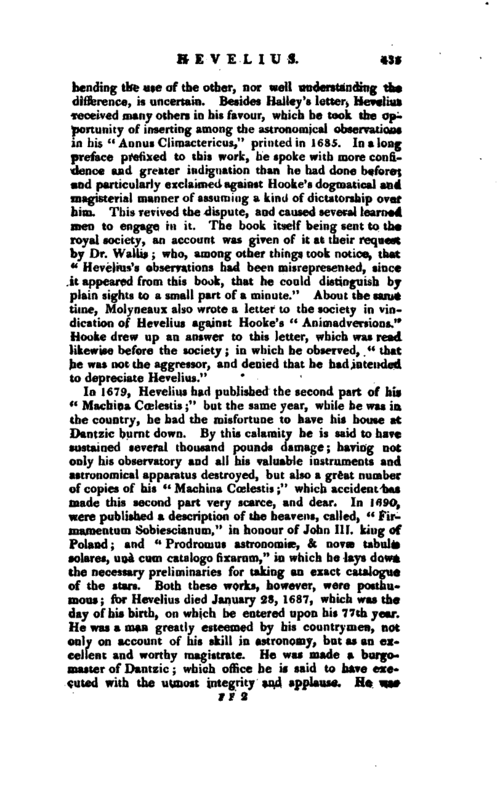 This, it is supposed, occasioned Hooke to print, in 1674, “Animadversions on the first part of the Machina Ccelestis;” in which he treated Hevelius with great disrespect, and threw out several unhandsome reflections, which were greatly resented; and the dispute grew afterwards so public, and rose to such a height, that, in 1679, Halley went at the request of the royal society, to examine both the instruments and the observations made with them. Halley gave a favourable judgment of both, in a letter to Hevelius; and Hooke, merely from his mode of managing the controversy, was universally condemned, though the preference has since been given to telescopic sights. Hevelius, however, could not be prevailed with to make use of them: whether he thought himself too experienced to be informed by a young astronomer, as he considered Hooke; or whether, having made so many observations with plain sights, he was unwilling to alter his method, lest he might bring their exactness into question; or whether, being by long practice accustomed to the use of them, and not thoroughly | apprebending the use of the other, nor well understanding the difference, is uncertain. Besides Halley’s letter, Hevelius received many others in his favour, which he took the opportunity of inserting among the astronomical observations in his “Ami us Ciimuctericus,” printed in 1685. In a long preface prefixed to this work, he spoke with more conn“­dence and greater indignation than he had done before; and particularly exclaimed against Hooke’s dogmatical and magisterial manner of assuming a kind of dictatorship over him. This revived the dispute, and caused several learned men to engage in it. The book itself being sent to the royal society, an account was given of it at their request by Dr. Wallis who, among other things took notice, that” Hevelius’s observations had been misrepresented, since it appeared from this book, that he could distinguish by plain sights to a small part of a minute.“About the same time, Molynea;jx also wrote a letter to the society in vindication of Hevelius against Hooke’s” Animadversions.“Hooke drew up an answer to this letter, which was read likewise before the society; in which he observed,” that he was not the aggressor, and denied that he had intended to depreciate Hevelins." Martin’s Biog. Philos. Ward’s Grwh, Professors. —Moreri. Saxii Onom.